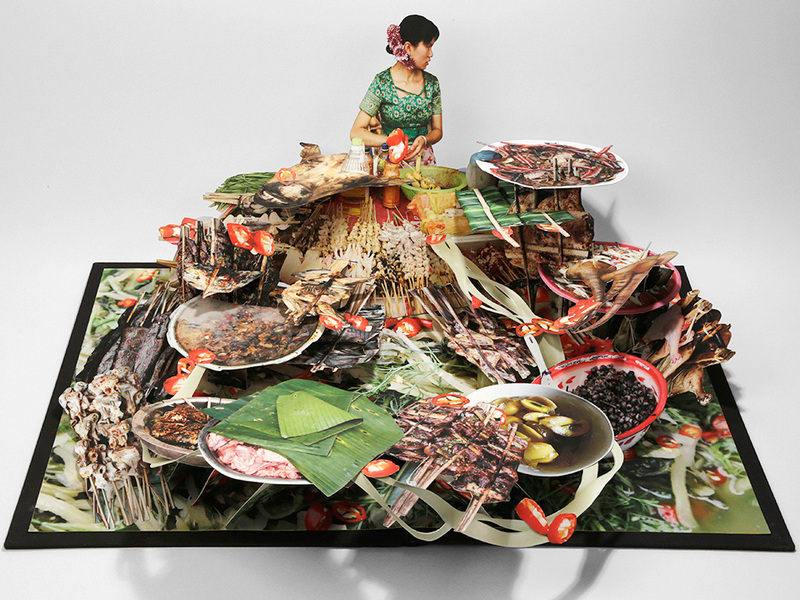 Former Fulbright scholar Colette Fu has been constructing pop-up books for the past decade. She has designed pop-ups for award-winning stop motion animation commercials and has freelanced for clients such as Vogue China, Canon Asia and Moët Hennessy • Louis Vuitton. Her work is included in the Library of Congress, the West Collection and many private and rare archive collections. China Digital Times: In 2010, you told the The New York Times that you are a “paper engineer.” How did you begin to work on pop-up photography books? Colette Fu: In graduate school–RIT fine art photography 2003–I worked primarily on the computer. I wanted to do something more with my hands, as I liked making things since a child. The summer before receiving my degree and turning in my thesis paper, I went to the Alden B. Dow Center for Creativity artist residency in Michigan where my proposal was to learn how to make pop-up books. I spent ten weeks there deconstructing used pop-up books I bought on eBay. With those prototypes I applied for four artist residencies that following year and started my first pop-up series “My 1st Pop-up Books,” which were a continuation of my thesis project at RIT. I’ve been going to artist residencies since then. CDT: Can you brief us on the history of pop-up books as a medium? Who works on pop-up books today? Have you bent the medium? If so, how? CF: Most pop-up paper engineers use illustration and draw on a white prototype. I start with digital images of my photographs and make a virtual model before I figure out how to pop them up. Gradually I am adding more sculptural elements like engraved wood or textiles. Here is a history of pop-up books written by an expert historian of the medium. CDT: You have family roots in Yunnan Province and traveled there as a Fulbright Scholar in 2008 to photograph the minority tribes of Yunnan for your most recent pop-up book series, “We Are the Tiger Dragon People.” Why did you choose to photograph minorities in Yunnan and how did this project relate to your personal heritage in the region? Also, what is the meaning behind the title of the book series? CF: My mother is from the black Yi tribe of the Greater Cool Mountains in Sichuan Province. She was born in Yunnan’s capital, Kunming. I went there in the 90’s to teach English at the Yunnan Nationalities University and stayed for three years and picked up a passion for traveling and photographing the villages. I made it to my mother’s ancestral home but the camera in my battery died leaving me with only a couple photos. There I discovered that my great-grandfather Lung Yun had not only helped establish the university where I was teaching, but was governor and general of Yunnan during the transitional years of World War II. His nickname was “the King of Yunnan.” These experiences helped me find a new sense of pride and identity and encouraged me to pursue a profession as a photographer and artist. After three years, I came back to the states to formally study photography and eventually get my master’s degree. With the help of a Fulbright fellowship, I traveled once again to Yunnan specifically to photograph for a pop-up book of the twenty-five ethnic minority groups that reside there. Twenty-five of the fifty-five minority tribes of China reside in Yunnan and comprise only 8.5% of the nation’s population, with the Han representing the majority. Many people inside China and most people outside are unaware of this cultural richness. These ethnic groups have customs, histories, religious practices, languages and lifestyles that greatly differ from their Han majority neighbors. While I am directly unable to help these groups preserve their identity and ways of living, I can only use my skills as an artist to spread knowledge and provide just a brief portrait of their existence. The title “We are Tiger Dragon People” was given to me by my Yi language teacher who specializes in the study of Yi culture and Bimou (Yi priest) religion. CDT: What was it like trying to photograph subjects in Yunnan? What do you remember about your experiences as a Fulbright scholar there? Did the people you photographed see your work in the end, and if so, how did they react? CF: I tried to blend in wherever I went. This was easier in the Northwestern regions of Yunnan where the people are darker and taller. It was much easier traveling in my 20’s and in my 30’s when I didn’t worry so much about things that could happen. Using a digital camera I was able to show people images of themselves immediately. I printed out photos for people if and when I returned to their village. No one has seen any of the pop-ups. CDT:Describe your process creating a pop-up book. When photographing subjects for the books, what considerations do you take? What have been some of the challenges and most memorable moments in constructing your pop-art from books to animations? CF: I’m still used to using film so although I use a digital camera now, I don’t actually take that many photos. I try to take frontal photos, full bodies, side or back angles and keep shadows minimal. I don’t like to carry a lot of equipment as it’s not safe, the weather is unpredictable, and carrying a camera can become quite heavy after a few hours. I also don’t want to bring attention to myself. I look at my images and try to collage a story from them. I’ll then build a prototype in black and white and then switch to color when I have the kinks figured out. A few years ago I had the opportunity to work with Duck Studios in Ojai, California. The illustrator made quick sketches on post-it notes and my job was to pop-up those images. A large team of illustrators, model builders, digital technicians, animators, etc. worked their magic. It was a lot of fun working with so many creative, fun and talented people. CDT: How has China and Chinese culture influenced your greater work using pop-art as a medium? Are pop-up books common in China? CF: Although many pop-up books are produced in China, they are not commonly available. I’m interested in incorporating more Chinese handicraft into my books, like Chinese knotting, embroidery and woodcarving. I’m going back to China next month for half a year and will continue my project about the ethnic minorities and will travel to a few more southwestern provinces. This past year I worked with the Asian Arts Initiatives and a homeless shelter in Philadelphia’s Chinatown North neighborhood. I really enjoyed working with the men there on the long-term recovery program. We made a set of pop-up cards with their photography and personal stories. While I have worked with community projects with marginalized populations before, this project sparked my interest in doing something similar when I return to China. My home base will be the Swatch Art Peace Hotel artist residency. There are so many stories to tell in Shanghai. CDT: Some reviewers of your work have commented that your pop-up art is anything but “child-like.” Have you found that people mostly associate pop-up books with children? Do you agree with these reviews? CF: Yes most people associate pop-up books with children. Most of my work is geared for an audience of all ages but there are often complex undertones that I don’t think most people see. CDT: What is the market like for pop-up books in the world? Are you interested in making your pop-up art into something that can be mass-produced and sold or will you remain focused on showcasing your unique creations in museum exhibitions? CF: Pop-up books are expensive to publish, and I was worried that a pop-up book about Yunnan Province’s minorities did not have enough mass appeal. It was my goal initially to work towards a publication but I have been consumed with working on paying the bills, teaching and experimenting on other things. I’ve set my goal to encompass the ethnic minorities of Southwest China and I plan on continuing to exhibit my work but hope to start a more serious conversation about publishing this year. As I continue to make more books and collect textiles, I hope to eventually have a large exhibit at a museum. CDT: Where can people view “We Are the Tiger Dragon People”? What’s next for you? Will you continue to make pop-up books that explore Chinese themes? CF: Occasionally I exhibit the books. I announce any upcoming shows on my website. Additionally, Booklyn Artists Alliance, an artist run non-profit organization for artist and bookmakers in Brooklyn, travels to help sell, promote and exhibit some of my books that I’ve been editioning over the past two years. My goal of publishing the work would help me reach a wider audience.